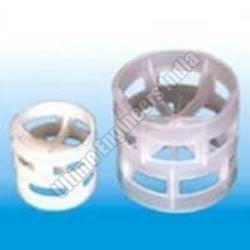 Ultimo Engineers is known as the leading Manufacturer, Exporter and Supplier of high efficiency Pall Rings in India. A wide range of Pall Rings are available with us, which is widely used in the Chemical, Petrochemical, Fertilizer, Chlor-alkali, Soda Ash, Pulp and Paper industries. The range includes Ceramic Pall Rings, Polypropylene Pall Rings, PVDF Pall Rings and Stainless Steel Pall Rings. Our Quality Pall Rings are available at reasonable prices. Ultimo Engineers is a renowned name in India and offers an impeccable range of products like Pall Rings, Raschig Rings, Intalox Saddles, Tellerette Rings, Liquid Distributors, Packing Support Plates, Ceramic Balls, Gas Scrubber, Graphite Heat Exchangers, Demister Pads, Wire Mesh Packings, Hi-Chrome Steel Grinding Media Balls and IMTP Rings. Based in Vadodara, the petrochemical and chemical city of Gujarat, the firm is termed as the foremost Manufacturer, Exporter and Supplier in the industry. Furthermore, the firm is an ISO 9001: 2008 certified organization, thus it believes in offering the unmatched quality products at the most affordable prices to the clients. For this, we purchase the highest quality materials from the reliable vendors in the international markets. Besides valuable services like Process Designing of Distillation Columns, Solvent Recovery Units and Gas Scrubbers and Gas Absorbers, are also provided by us. This way, we have been able to establish a successful base all over the world such as in India, UAE, Spain, South Africa, Gulf Countries, East Europe, South America and many other regions.